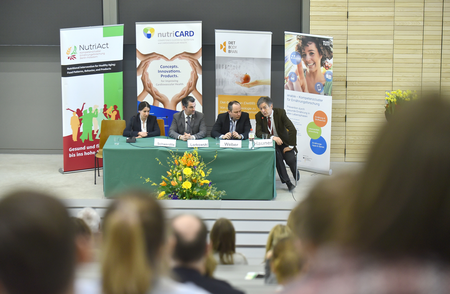 The congress with about 600 participants organized by the German Nutrition Society (DGE) took place from March 7th to 9th 2018 in Stuttgart-Hohenheim. Within a session on competence clusters in nutrition research Bernd Weber gave an overview of the aims, thematic areas, the profile and first results of the regional network. In addition to DietBB the three other competence clusters of nutrition research promoted by the Federal Ministry of education and research (BMBF) were presented through their speakers. About 60 persons attended this session and discussed the topics.